With superlative signal processing in an intuitive interface, VMR is one of the finest classic hardware emulation setups to date. Superb-sounding processors. Very slick interface. Two-tier presets for Rack and modules. Sensible automation implementation. Reviver is a nice freebie module. Modules can be moved between instances. No low-pass filter. No split/parallel signal routing. Lacks gain controls for levelling. 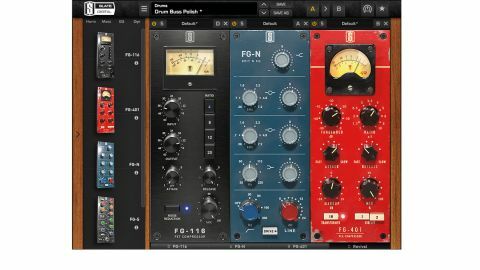 Slate Digital impressed us in 2013 with Virtual Buss Compressors, and its latest outing, Virtual Mix Rack (VMR), follows the same path, being based on schematics and deep analysis of some classic hardware processors. Loosely based on the API's 500 series modular format, which now features in many 'lunchbox' racks, VMR centres on an eight-slot Rack plugin (VST/AU/RTAS/AAX) that hosts a range of proprietary modules. The Rack is downloadable for free, coming with the non-expiring Revival enhancer and 15-day demos of the four main modules, which can be bought at any time as a set. Each element (the Rack plugin and each individual module) requires its own licence (iLok 2), clearly preparing the ground for the introduction of more modules in the future. The Rack workspace is divided into three main sections: Preset Bar at the top, module Library (which can be folded away) to the left, and the main vertical module Slots (labelled A to H). Modules are launched into the Slots from the Library panel and are reasonably large. The window scale isn't user-adjustable, but it does resize according to screen resolution: with the Library panel closed, a 1280x800 display shows four modules, and a 1920x1200 screen shows six. "The FG-116 delivers your typical FET compressor sound, with lightning fast attack and release"
Navigating between active Slots is done using the tabs at the bottom, and modules are rearranged by dragging them. The Rack signal flow follows the module order from left to right, and though you can reorder the modules, we were slightly disappointed to learn that there are no further routing configurations for split/parallel routing, a la T-RackS (though VMR's compressors do have dry/wet controls, which will take care of most parallel compression needs). VMR has two Preset types: Rack and Module, loaded from the Preset Bar and Slot header respectively. Rack presets are chains of modules, while Module presets are simply settings for individual modules. Further options include an A/B Snapshot function for the whole Rack, module Solo (with grouped solo via the Cmd/Ctrl modifier), individual module bypass, and Rotary Knob mode for circular mouse movement. Finally, automation can be targeted on each Slot, and clicking a Slot letter reveals its parameter list, with everything named as it will appear in your DAW. VMR's four main modules (we're not including Revival in that category) comprise two EQs and two compressors, and draw heavily on a range of legendary hardware. The FG-116 compressor is a very thorough emulation of the UREI 1176, while the FG-401 is based on several classic designs, and includes two separate circuits and a transformer circuit. The two EQs - FG-S and FG-N - are clearly based on the SSL E series and Neve 1073 designs respectively, but with some minor enhancements. The FG-116 delivers your typical FET compressor sound, with lightning fast attack and release. It's great for shaping snare drums, adding attack to bass guitar, and bringing edge to vocals. With the latter, FG-116 perfectly captures the 'enhancing' nature of the hardware that inspires it. It includes a mix control, which is welcome (and not found on the original hardware), but, alas, it lacks the real thing's 'all buttons' mode. FG-401 is the most feature-rich of VMR's modules, and we understand that it's modelled on the Empirical Labs Distressor and Teletronix LA-2A. The Circuit 1 setting is a snappy, Distressor-style option, for adding punch to drums, sub-mixes and the mix bus. Circuit 2 is a different kettle of fish altogether, doing a great job as a transparent 'gluing' compressor. The compressor also exhibits practically imperceptible low-level harmonic distortions, which only become truly audible when switching in the Transformer circuit - great for adding bite to vocals, guitars and keyboards. The FG-N EQ is like a supersized Neve 1073, offering not one but two parametric bands with identical frequency ranges (360Hz to 7.2kHz), plus high and low shelves, and a high-pass filter. There's also a Drive option, which switches the Line level control over to a gain-compensated drive control. The effect of this is subtle, rebalancing harmonic distortions by enhancing the second harmonic. "Slate Digital really earned its processing spurs with Virtual Buss Compressors, and VMR casts the same net a bit wider"
Our favourite feature, though, is the fully sweepable frequency controls. Overall, FG-N is a far more powerful shaping tool than the original hardware. FG-S delivers your classic, powerful SSL E-Series-style EQ. That means audible enhancement combined with reasonably narrow Q, when needed. The only negative with this one is the single high-pass rather than twin high- and low-pass filters. Indeed, the lack of low-pass filtering within VMR is a drawback. Finally - and separately, really - Revival. This combines tube, tape, transformer and EQ modelling in a two-knob 'sweetening' effect that's great at poshing up sub-mixes (particularly drums) and works well in small doses on the mix bus. Slate Digital really earned its processing spurs with Virtual Buss Compressors, and VMR casts the same net a bit wider. The design is slick and delivers excellent results quickly. In terms of flexibility, drag and drop reordering is standard fare for most DAW inserts, so it offers nothing special in this regard; and the lack of flexibility in terms of inter-module signal routing feels like a missed opportunity. Nevertheless, the sheer quality of the emulations more than saves the day, and we look forward to seeing what new modules become available down the line.